Join us in the Hormel Center on Tuesday October 31st, from 6-7:30pm as Lisa E. Davis discusses Undercover Girl ! The author will present a slideshow of archival images from her research on Angela Calomiris, which have their own riveting story to tell, and read from her book. At the height of the Red Scare, Angela Calomiris was a paid FBI informant inside the American Communist Party. As a Greenwich Village photographer, Calomiris spied on the New York Photo League, pioneers in documentary photography. While local Party oﬃcials may have had their suspicions about her sexuality, her apparent dedication to the cause won them over. When Calomiris testified for the prosecution at the 1949 Smith Act trial of the Party's National Board, her identity as an informant (but not as a lesbian) was revealed. Her testimony sent eleven party leaders to prison and decimated the ranks of the Communist Party in the US. Undercover Girl is both a new chapter in Cold War history and an intimate look at the relationship between the FBI and one of its paid informants. Ambitious and sometimes ruthless, Calomiris deﬁed convention in her quest for celebrity. With a PhD in Comparative Literature, Lisa E. Davis taught Hispanic language and literature at SUNY Stony Brook and York College CUNY. She also collaborated with the Center for Puerto Rican Studies (Hunter College, CUNY) on Areíto, a publication of the New York-based Círculo de Cultura Cubana, while contributing articles to numerous publications in Spain and Latin America. Her novel Under the Mink (2001, 2015) recreates the 1940s world of Mafia-owned Village nightclubs that featured drag shows and strip acts. 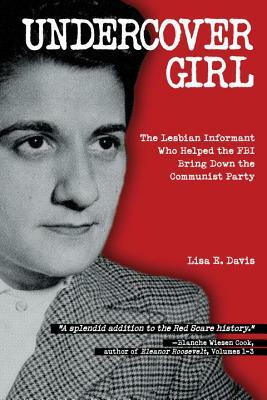 Her recent nonfiction Undercover Girl (2017) chronicles the career of a lesbian FBI informant and prosecution witness at the 1949 Smith Act trial of the National Board of the American Communist Party. Other highlights of her career include meeting Fidel Castro and almost drowning in the Colorado River.